At the Session on Library and information Science in Developing Countries, Mr. Choy Fatt Cheong spoke on Organizing Librarians for Greater User Engagement. He emphasized that libraries have to be more than their collection and evolve as a collection of librarians. He provided an overview on changing role of libraries for greater engagement in the Nanyang Technical University, Singapore context. This was followed by the presentation of 5 papers covering topics on translation service, library and Information centres in higher education, student’s perception, e-learning and creativity and innovations in libraries. At the session on Managing Change in 21st century, Mr. Prakash Chand talked on Indian Citation index. Papers were presented in the context of space management, managing school libraries, corporate social responsibilities, academic liaison libraries, ICT competency and challenges for college libraries. At the Knowledge Management, Knowledge Organization and Information Retrieval session, Dr. Dinesh Rathi reported on a survey on how non-Profit Making Organizations (NPOs) of Canada use Social Media for sharing of Knowledge. The contributed papers covered issues like metadata standards for OERs, KM tools and techniques and KM in academic libraries. At the session on Innovative and Emerging Technologies, Dr. Samyukta Ravi spoke on leadership management in University libraries. He presented a case study of Pondicherry University library as a role model of leadership that led to manage and carve a niche among the world class libraries of today. There were 13 papers on information access, cloud computing, RFID technology, QR code, Web 2.0 tools for libraries, designing library website using google site, MIS for libraries etc. At the session on Human Resources Development, Mr. Sam Popowich talked on implementing web-scale discovery system. Papers presented covered issues on HR development, information literacy skills, lifelong learning, soft skills training, creative innovations and entrepreneurship, internship and job satisfaction. At the session on Copyright, IPR and Professional Ethics, Dr. Daulat Jotwani spoke on the marketing of the e-resources in the IIT libraries and Dr. Pradeepa Vijetungi presented the journey towards consortia of e-journal in SriLanka. Papers presented covered topics on copyright issues, anti-plagiarism software, unethical practices, and licensing agreements for e-journals, e-learning awareness among LIS professionals, leadership and reading habits. At the session on Open Access to Scholarly Communication, Dr. C. K. Ramaiah spoke on Digital Rights management in the context of e-books. Dr. N. V. Satyanarayana spoke on open access movement and publishers’ role in this context and Peggy Sue Ewannyshyn shared her experience in digitization project of University of Alberta. This was followed by 3 contributed paper presentations on open access issues. At the session on E-Resource Management, papers were presented on N-LIST programme, present scenario of consortia of library networks, e-resource subscription, library collection assessment and development, marketing of library products and services, cloud computing and use of e-resources etc. 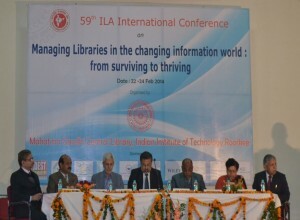 The conference theme of “Managing libraries in the changing information world: from surviving to thriving” was taken up by the Panel Discussion at the last session. The panelists comprising Dr. S. S. Murthy, Dr. N V Satyanarayana and Mr. Yogendra Singh deliberated on paradigm shift in the library and information services due to proliferation of knowledge resources and invasion of modern ICT tools and applications. They emphasised the need for LIS professionals to gear up for the changing requirements and bring in innovations and creativity to thrive in the present knowledge society. The session was moderated by Prof. S M Shafi. 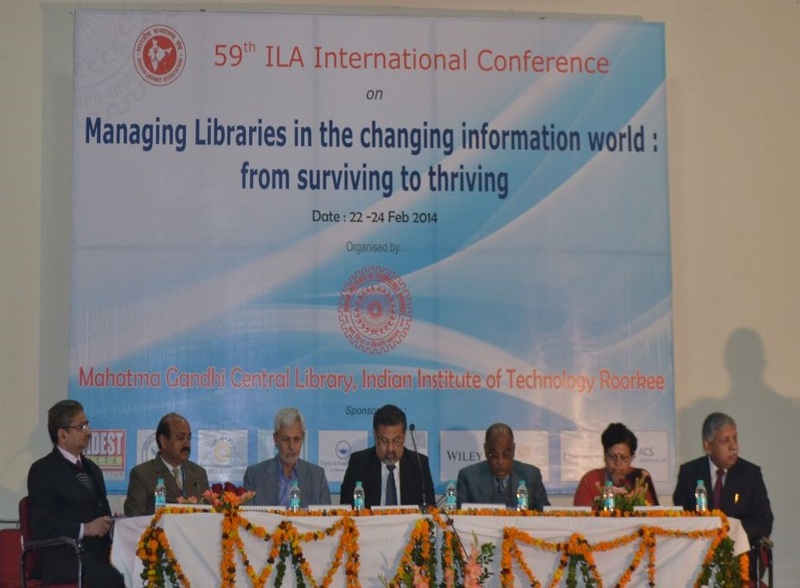 Chief Guest, Prof. P. V. Mangla in his valedictory address gave an overview of the evolution of the Library and Information Science profession in the country. He emphasized the recommendations of the National Knowledge Commission in the context of libraries and the future activities to be taken up under the National Library Mission. He focused on the need for a change from Library and Information Science to Library and Information Management in the changing scenario. The academic status for librarians in the universities need to be at par with the teaching profession as librarians, with their expertise in knowledge, technology, tools and management, have to play a major role. Indian Library Association – ILA should organize short term on continuing education training programmes, workshops etc. to build awareness about ICT tools and applications, at regular intervals, to keep professionals abreast of latest developments in the LIS field. ILA should work towards initiating a project on benchmarking of best practices in the country and develop parameters for quality assurance in service delivery and share them through its website and other publications. ILA should play an active role in advocacy of Open Access and approach UGC, MHRD, CSIR etc. to develop a mandate for adoption of Open Access policy by institutions of higher education, R&D institutions. ILA has to play an active role in supporting the educational institutions in developing interoperable institutional repositories. ILA should take an active role in developing a policy for digitization of resources in the country and pooling resources to archive, preserve and disseminate indigenous historical and cultural assets. ILA should take up the issue of establishing a National Board of Accreditation for Assessment of Library & Information Science schools and develop s mechanism for controlling the unplanned proliferation of LIS schools in the country with UGC and MHRD. Information Literacy and Lifelong Learning are key elements for the development of generic capabilities of individuals and need to be included in the core and continuing education of information professionals, educators, policymakers, administrators etc. This should be embedded in education and training programs at all levels and ILA needs to take up the issue with UGC, education Boards and MHRD for mandating its inclusion in the curriculum at all levels. LIS professional’s soft skills training need to be embedded in the LIS curriculum to increase their employability. ILA should take up the issue with UGC and MHRD in mandating its inclusion in the curriculum at all levels by LIS schools. Major developments have taken place in the last decade and the LIS curriculum across the country needs a complete overhauling. The CDC report (2001) of UGC needs to be revised to keep in view the present day requirements. ILA needs to take up this with the UGC for revision of the CDC report.